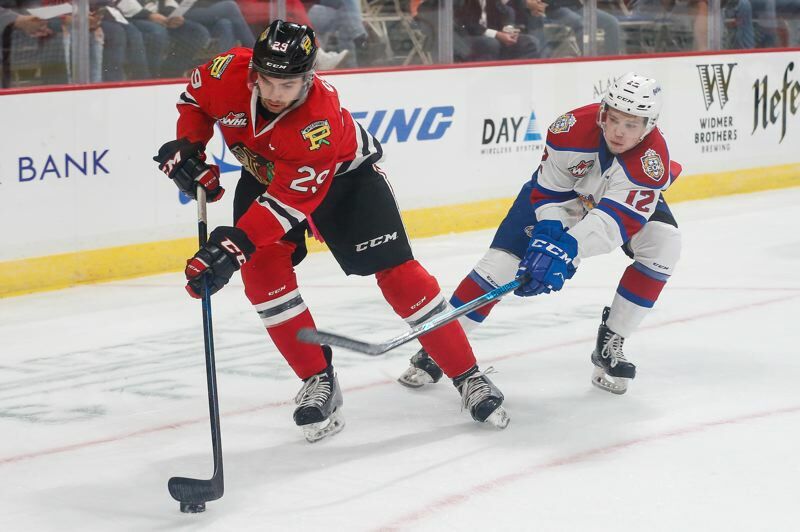 The fifth consecutive win for the Portland Winterhawks was something special. Dominating on special teams, the Winterhawks beat the Edmonton Oil Kings, 8-2, on Wednesday in front of 2,501 fans at Memorial Coliseum. Portland scored on four of six power plays, killed all eight Edmonton power plays and tallied a Cody Glass a shorthanded goal. Portland improved to 5-2-0-1 (11 points) to remain atop the Western Hockey League U.S. Division. The Hawks have scored a league-best 45 goals eight games into the season. Edmonton (5-4-0-1, 11) dropped its fifth in a row. Glass, in his first game after being named the Winterhawks' 43rd team captain earlier Wednesday, had two goals and two assists. Teammate Joachim Blichfeld continued his fast start with five assists. Glass, Blichfeld and Reece Newkirk teamed up for two first-period goals. Glass opened the scoring 5:04 into the game, and Newkirk scored his fifth goal of the season at 12:07. Edmonton scored eight seconds into the second period to pull within a goal, but the Winterhawks used a five-on-three power-play goal from Ryan Hughes and a power-play finish from Mason Mannek in front to build the lead to 4-1 just 3:28 into the second frame. The Winterhawks then were shorthanded for a stretch of 6:43, during which Edmonton had 1:18 with a five-on-three advantage. But it was Portland who scored the only goal of that stretch as Glass converted off a two-on-one feed from Blichfeld to make it 5-1 at 9:27 of the second period. Edmonton did get a second goal shortly after the power plays expired. Michal Kvasnica scored 13:31 into the second, Portland's fourth goal of the period, to make it 6-2. It was the first WHL goal for the 18-year-old rookie winger from the Czech Republic. The Winterhawks added two power-play goals in the third period. Jake Gricius collected his fifth goal of the season at 6:48, and 16-year-old Cross Hanas scored his first career goal at 16:07. Glass finished with two goals and two assists. Newkirk (goal, two assists), Hughes, (goal, assist), Hanas (goal, assist) and Seth Jarvis (two assists) also had a multi-point game. Portland goalie Shane Farkas stopped 28 of 30 shots for his fifth win of the season. Glass, in his fourth season with the Winterhawks, played his 207th regular-season game on Wednesday. The 19-year-old Winnipeg, Manitoba native and NHL Vegas Golden Knights prospect has 85 goals and 155 assists in those regular-season games. In addition to naming Glass as captain, VP/GM/coach Mike Johnston named five alternate captains. Brendan De Jong will be alternate captain for all games. Hughes and Gricius will be alternate captains when the team wears white. Blichfeld and D-man Jared Freadrich will wear the "A" when the Hawks wear red. Next for the Winterhawks is a 5 p.m. Sunday game at Moda Center against Everett.